Midfielder Olly Lee is targeting a return to Wembley for the Hatters as they begin their Johnstone’s Paint Trophy campaign this evening. 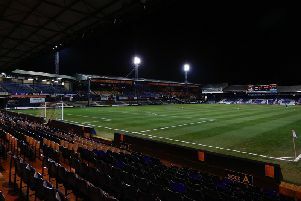 Luton won the competition back in 2009, with over 40,000 fans converging on the home of football to witness a 3-2 victory over Scunthorpe United. Although far less than that will be in attendance at Kenilworth Road for this evening’s first round tie against Leyton Orient, Lee is well aware of just how much that day meant to supporters. He said: “You see all the pictures at the training ground of the Johnstone’s Paint win so that would be nice to do it again this season. Lee, who played 120 minutes against Stoke City in the Capital One Cup last Tuesday night, was on from the interval during Town’s 2-1 defeat to Portsmouth on Saturday, is hoping for another outing, as he added: “For me personally, I just want to be on the pitch. “I don’t care if it’s JPT, league, FA Cup, anything, I want to be out there getting minutes under my belt and showing what I can do. “I’ve told the gaffer I just want to play every minute, I really enjoyed Tuesday and was desperate to play against Portsmouth as well, but it was probably the smartest thing from the gaffer not to start. Hatters boss John Still admitted he hadn’t wanted to use Lee so soon after completing his first full game on Tuesday night since playing against Luton for Plymouth Argyle back in January 2015, but was left with little alternative after an injury to Mark O’Brien. He added: “Mark slightly pulled his abductor in his groin, so as Olly played 120 minutes the other day, I didn’t really want to use him, but he was the ideal or only real change for that position. “He’s not a replacement for (Nathan) Doyle, who give us that little bit of defensive protection although Olly can actually do that in a different way.